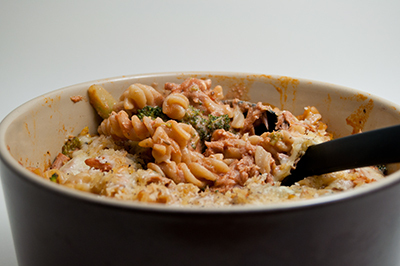 I fancied trying a new quick weeknight recipe that would use up some of the ingredients in my cupboards and this is the recipe I found to have a go at – Tuna and Broccoli Pasta Bake. Heat the reserved 1 tbsp oil in a large pan. Tip in the tomatoes, plus 200ml water and simmer while you cook the pasta (in a separate pan), according to the packet instructions. Add the broccoli for the final 3 minutes of cooking, then drain, reserving some water. Heat the grill to high. Stir the soft cheese into the tomatoes until melted, then mix with the pasta, broccoli and tuna. Season. Tip into an ovenproof dish, then sprinkle on the cheddar and crumbs. Grill for 5 minutes, until golden and bubbling. I have scaled this recipe down for two people and did make a few alterations. I decided to use tuna in brine instead of oil, as its what we get normally, and left out the tablespoon of oil. This will cut the calorie content as well. I had some leftover passata in so I used that instead of the tinned tomatoes – so for two people I used 200g passata and the full 200ml of water mentioned in step 1 of the method. I also cooked my broccoli for closer to 10 minutes with the pasta as we are not that keen on crunchy vegetables and I used brown pasta, to make the meal slightly healthier. I did however add two slices of bacon that I had hanging round in the fridge. I fried them using frylight and added them to the tomato mixture. This is probably the best pasta bake from scratch recipe I have tried. Normally I find they end up watery and fall apart easily. However the cream cheese in the passata helped to make the sauce creamier and thicker and bound everything together very well. The light cream cheese gave it a smooth taste which is an improvement on plain tomatoes. Finally I have found a recipe that means I don’t need to buy jars of pasta bake sauce any more. The recipe was also less time consuming than other pasta bakes I have tried, as the final stage was only the grill for 5 minutes rather than baking in the oven for 20 minutes. I think that any number of different types of meat or vegetables could be added to this recipe to make different variations – chicken, sausage, mushrooms, peppers, peas, and I will definitely be doing it again sometime. And next time I’m going to pick a recipe that doesn’t use either passata or broccoli as I can’t spell either word and have to check them each time! Sounds good although I’m allergic to seafood so it wouldn’t be great for me. I make a broccoli, chicken, egg noodle recipe but it is just put together with a bit of olive oil, garlic, and lemon juice. My kids like it but it is really simple.